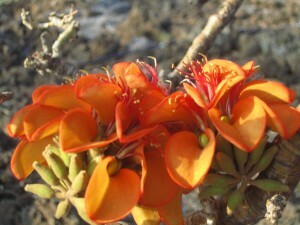 Uhiuhi (Mezoneuron kavaiensis) is a critically endangered endemic tree species that still persists in the Waikoloa Dry Forest Preserve. 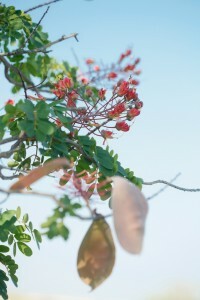 It is a legume, has beautiful magenta flowers and makes large light pink seed pods that can be seen from a distance ornamenting the trees in the preserve. 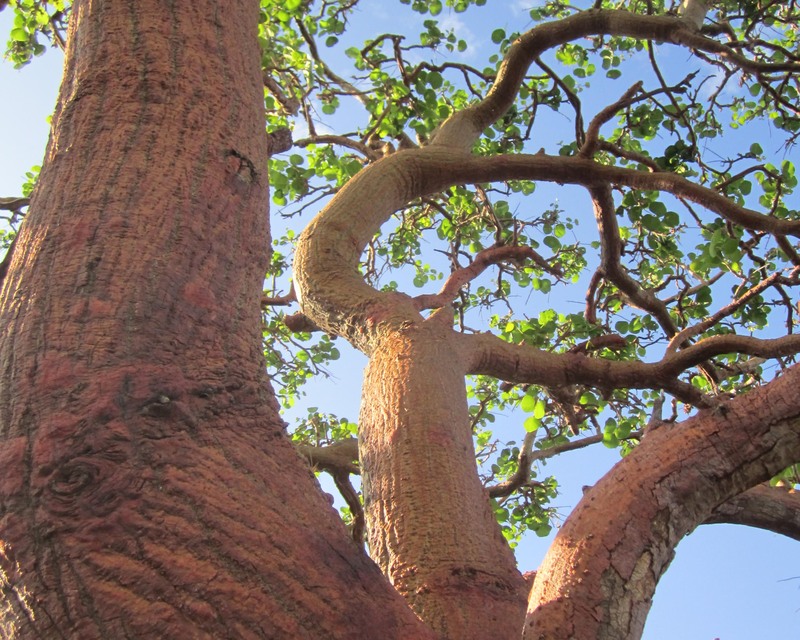 The uhiuhi can be put into two categories: kūpuna and keiki, ancients and seedlings. There are no young trees other than those recently planted, and the future of the uhiuhi in our forest has been relying on the seeds of just a few very old trees for many years. Luckily they are still productive. Each year we collect the seeds of the mature uhiuhi trees, germinate them and nurture them until they are ready to plant out into the forest. 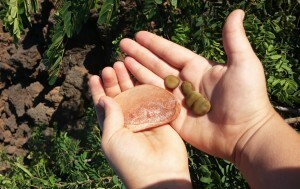 One of the main goals of planting uhiuhi trees, and other native plants, within the preserve is to help promote a more self-sustaining forest. By planting we hope to speed up forest recovery and give the trees a head start in competing with weeds and handling the tough conditions in Waikoloa. This week we harvested the first seeds from a small uhiuhi tree planted in October of 2012 by one of our dedicated volunteers. The flowers emerged earlier in the year and, although we were hopeful, we were surprised to find that seeds had developed successfully in such a young plant. These seeds are too precious to let fall on the ground where they may be just as likely to be devoured by a rodent as they are to germinate and grow into an adult plant. We will keep them stored until we are ready to germinate and grow them in our nursery and eventually plant them out, as the first uhiuhi from a new parent tree since our work began. Our staff will be offering an interpretive walking tour of the preserve next week. You will have the opportunity to get up close to some of our ancient wiliwili trees which are just getting ready to blossom. We will also tour our restoration areas and get to know some of the native plants in our nursery. There will be ample opportunities for photos! A minimum $20 donation per group is encouraged. Meet at the corner of Waikoloa Road and Quarry Road just before 9am on Friday August 29th. Wear good shoes or hiking boots and bring a water bottle. Please RSVP through the link below. We hope to see you there.